“… how do I recover Microsoft Office Word, PowerPoint, Access files?” This may happen if you accidentally close MS Office program window without saving the current version of the document file. Newer Microsoft Office 2010 has extended “Auto Recover” capabilities, with more options to recover unsaved version of Office documents. 1. Launch MS Office program on your computer. 2. Goto File > Info and click ‘Manage Versions’ button. 3. It will show list of unsaved versions of current document. You can recover and save any available version of the document file. 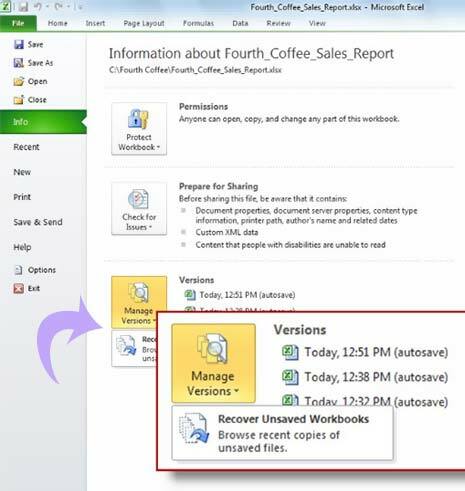 You can access upto 5 auto save versions of your previously saved active document. If you save and close your document, all autosave versions are automatically deleted. If you close a previously saved document without saving, your last autosave version is kept until your next editing session. Unsaved files are saved for four days before they are automatically deleted.